However, that initial reacton couldn’t be further from what we actually get here. While it appears from the first few panels to be a comic appealing squarely to the animal rights readers (something it undoubtedly does), it actually delves far deeper than that. There aren’t many answers given in this first issue but Matthew and Brittany Loisel raise many interesting ideas that are definitely worth exploring. 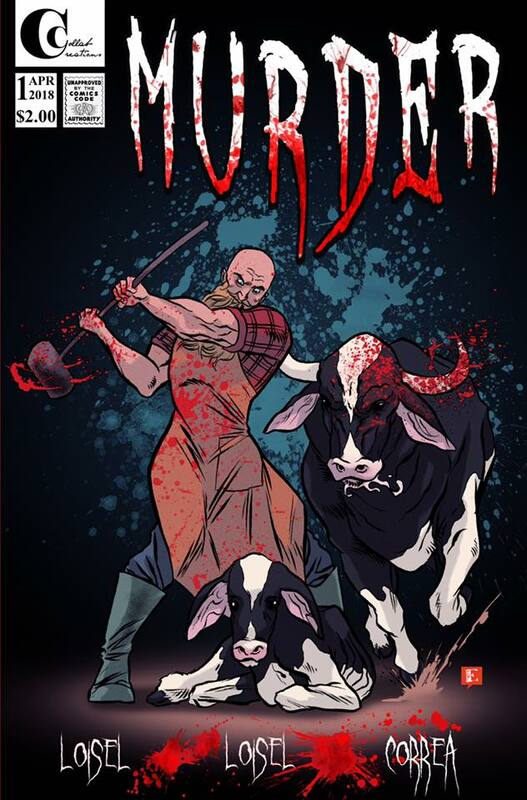 The comic opens with a snapshot of two years from now, and an activist called the Butcher’s Butcher who, alongside his bull companion, is meteing out some personal justice to the head of a meat factory. We’re also handed an interesting titbit regarding the potential of an animal’s brain when it’s properly tapped into. After that brief encounter we’re flung back to the present day with probably one of the most disturbing sequences I’ve ever read in a comic. It follows the growing sentience of animals but in this case, it’s framed from the perspective of newly born chicks in a battery farm. Interspersed with the conversation of two workers it took me a second to realise who the “Mommy? Ouch! Where am I?” was coming from, but when I did I struggled to read on because I knew exactly where it was going to end up. Honestly, this first issue is worth reading just for this scene. Yes, it’s disturbing but it’s also fascinating how just by giving these creatures a voice it makes something we usually ignore infinitely more personal. It’s also wonderfully drawn by Emilano Correar with realistic animals and stark black and white, an approach which gives it more of an impact and makes the actions of the characters really pop out of the page. At the end of the day, Murder is a wonderfully unique comic which not only deals with an issue that many people brush aside, but does so in a way that produces an issue I would genuinely class as a piece of art. Make sure to like the official Murder by Matthew & Brittany Loisel Facebook Page for the latest news and information on how to get your hands on the first issue. I simply cannot put comedy and murder in one sentence. This does does sit comfortably wth me. This isn’t a comedy though?